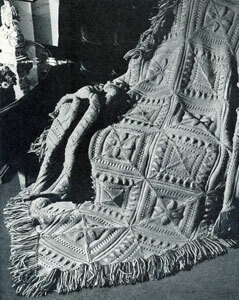 This free pattern originally published by The American Thread Company, Star Afghan Book, Book 52, in 1947. 59--1 1/4 oz. Skeins Light Blue or any other desired. 4-- 1 1/4 oz. Skeins Medium Blue or any color desired. 1 pr. Bone Knitting Needles No. 4. Each Square measures about 7 1/2 inches. 60 Squares 6 x 10 are required for Afghan illustrated. MOTIF. Cast on one st and K 2 sts into it. 2nd Row. K 1, K 2 in the next st.
3rd Row. K 2, K 2 in next st. Continue knitting increasing 1 st in last st until there are 23 sts on needle. 23rd Row. Purl across row and increase (continue increasing at the end of each row until 61st row has been completed. The increases will not be referred to again and must be added to each row except in rows 24 and 36. In these 2 rows the complete directions are given). 24th Row. K 1, * K 2 together, K 1, over, repeat from * 6 times, K 2 and increase. P 1 row, K 9 rows, P 1 row. 36th Row. K 1, * K 2 together, K 1, over, repeat from * 10 times, K 2 and increase. P 1 row. K 4 rows. 42nd Row. K 3, over, K 1, over, * K 6, over, K 1, over, repeat from * 4 times, K 3. 43rd Row. K 4, P 3, * K 6, P 3, repeat from * 4 times, K 3. 44th Row. K 4, over, K 3, over, * K 6, over, K 3, over, repeat from * 4 times. K 4. 45th Row. K 5, P 5, * K 6, P 5, repeat from * 4 times, K 4. 46th Row. K 5, over, K 5, over, * K 6, over, K 5, over, repeat from * 4 times, K 5. 47th Row. * K 6, P 7, repeat from * 5 times, K 5. 48th Row. K 6, * sl 1, K 1, pass sl st over K st, K 3, K 2 together, K 6, repeat from * ending row with K 6. 49th Row. K 7, * P 5, K 6, repeat from * across row ending with K 6. 50th Row. K 7, * sl 1, K 1, pass sl st over K st, K 1, K 2 together, K 6, repeat from * ending row with K 7. 51st Row. K 8, * P 3, K 6, repeat from * across row ending with K 7. 52nd Row. K 8, * K 3 together, K 6, repeat from * ending with K 8. K 4 rows, P 1 row, K 1 row, P 1 row, K 2 rows. 62nd Row. Start decreasing, K to within the last 3 sts, K 2 together, K 1. 63rd Row. Purl to within last 3 sts, P 2 together, P 1 (decrease 1 st at end of each row in same manner. Decrease will not be referred to again and must be added to each row except in rows 76, 80 and 121. In these rows the complete directions are given). K 1 row, P 1 row, K 9 rows, P 1 row. 76th Row. K 1, * K 2 together, K 1, over, repeat from * 14 times, K 2 together (47 sts on needle). P 1 row, K 1 row, P 1 row. 80th Row. K 1, * K 2 together, K 1, over, repeat from * 12 times, K 1, K 2 together, K 1 (43 sts on needle). P 1 row, K 9 rows, P 1 row, K 1 row, P 1 row, K 1 row, P 1 row, K 2 rows. 98th Row. K 12, over, K 1, over, K to end of row. 99th Row. K 12, P 3, K to end of row. 100th Row. K 11, over, K 3, over, K to end of row. 101st Row. K 11, P 5, K to end of row. 102nd Row. K 10, over, K 5, over, K to end of row. 103rd Row. K 10, P 7, K to end of row. 104th Row. K 9, over, K 7, over, K to end of row. 105th Row. K 9, P 9, K to end of row. 106th Row. K 8, over, K 9, over, K to end of row. 107th Row. K 8, P 11, K to end of row. 108th Row. K 7, sl 1, K 1, pass sl st over K st, K st, K 7, K 2 together, K to end of row. 109th Row. K 7, P 9, K to end of row. 110th Row. K 6, sl 1, K 1, pass sl st over K st, K 5, K 2 together, K to end of row. 111th Row. K 6, P 7, K to end of row. 112th Row. K 5, sl 1, K 1, pass sl st over K st, K 3, K 2 together, K to end of row. 113th Row. K 5, P 5, K to end of row. 114th Row. K 4, sl 1, K 1, pass sl st over K st, K 1, K 2 together, K to end of row. 115th Row. K 4, P 3, K to end of row. 116th Row. K 3, K 3 together, K to end of row. 117th, 118th, 119th & 120th Rows. K across row. 121st Row. K 2 together as illustrated matching rows, having 6 squares in width and 10 squares in length. Attach yarn in corner, ch 4, skip 2 sts, sdc in next st (Sdc: yarn over, insert in st, pull through, yarn over and pull through all loops at one time. ), * ch 1, skip 2 sts, sdc in next st, repeat from * all around working 3 sdc with ch 1 between each sdc in corners. FRINGE. Take a 12 inch strand of Light Blue and one of Medium Blue, double in half and pull through mesh, draw ends through loop. Repeat all around. Trim fringe evenly.